Discussion Email unconfirmed user can create posts. Email unconfirmed user can create posts. I made a test user and im able to post without confirming email. I dont want user approval. I want users to be able to confirm email and only then be able to post. So when user registers and not email verified he should be "User Unverified" role (pic below). When he confirms email, he should be Member. I have tried many posts with similar issues but dont seem to be successful with my config. please help. $Configuration['Garden']['Registration']['ApplicantRoleID']     = 4; // The "Applicant" RoleID. $Configuration['Garden']['Registration']['InviteExpiration']    = '1 week'; // When invitations expire. This will be plugged into strtotime(). The effect is, that every new user is automatically a member. What you want is that a new user is an unconfirmed user. If you found that line in /conf/config.php, change "8" to "3" (which should be the role id of the unconfirmed role), otherwise add the line $Configuration['Garden']['Registration']['DefaultRoles'] = array('3'); to this file. Don't change /conf/config-defaults.php! It should be working afterwards for new members. I thought changing that config setting sort of "fixes" that behavior. Are you sure that your unconfirmed is not allowed to post? Have you checked that in the role permission? @R_J Yes, Unconfirmed is not allowed to post or comment. I did some googleing and found this I realised there was no mention of ConfirmEmailRole in my Config.php or Config-defaults.php. Check @River 's post. So I did below changes and now the new unconfirmed user doesn't even see the "New Discussion" button or "Comments editor". Once email is confirmed he can make comments or post. Weird thing is that regardless confirmed or unconfirmed, the user list shows the unconfirmed user as "Member" role only. That config setting is only there for backward compatibility, but if it helps you, that's great. You have set the "DefaultRoles" to 8/Member. If you also set this to 10, your unconfirmed users should only have the unconfirmed role. But you've said already that they have both roles if you do so... Sorry, I don't know of a way to prevent that. Yes. Anyways this should suffice my spam issue. I've got Captcha enabled for registration, is that any better than the questions?? Cpatcha looks and feels much better than typing an answer. what do you think?? Ill also look at the Promote plugin. Is there a way to stop users with lets say less than 5 post count from making posts with links ?? Personally I very much dislike captchas. I know that they are no problem for a good AI and at least 30% of all captchas I am confronted with are a problem for me and I solve them wrong the first time. The "I am a human" from Google looks nice, but since I most of the time block the information they need to recognize me as a human, I have to go through the same "click on the traffic sign/shop fronts/whatever" procedure. At least I enjoy the "click on something" more than the "what text do you see". A registration question like "which color has my logo" is unsolvable for most bots. The downside is, that a human needs to only solve this one time to fire a thousand bots on your page. I thought @peregrine had written a plugin which prevents links in the first posts of users, but I haven't found it. Writing such a plugin would be similar to the promoteAfterModerated, but a little bit less complex. I've got Stop Forum Spam, Akismet and Captcha (one with I am a Human). So I'm covered for the bots. I saw some Human spammers with decent gmail ids spamming about decent websites, music shows, local stores, etc.. volume is very low for these and my forum though is old, I have started working to grow it just now after moving it to Vanilla. With the below structure in mind, If I want to use the Promote Plugin, Do I need to add another role?? I did below changes and now the new unconfirmed user doesn't even see the "New Discussion" button or "Comments editor". Once email is confirmed he can make comments or post. Weird thing is that regardless confirmed or unconfirmed, the user list shows the unconfirmed user as "Member" role only. What should I set here in the promote plugin?? obviously the below options dont work. 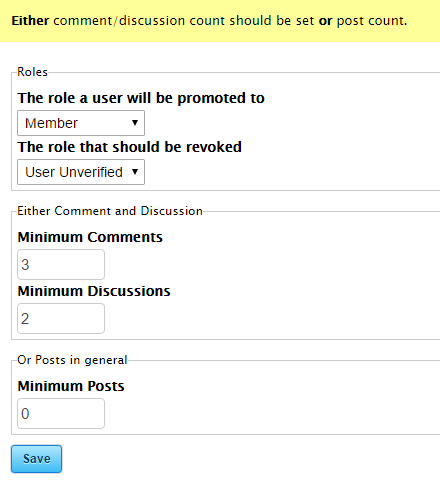 The check and the role promotion are made in the moment where the admin moderates a post. So if you publish a post of user it is checked if all criteria are met: in this case: does this user has at least 3 published comments and 2 published discussions? If yes, remove role A and set role B. If not, do nothing. If the plugin is not working for you it might have been because you expected that users would be changed automatically when you activate the plugin. But without moderator action, nothing will happen. Ok Got it. I set another role and set the procedure again with a test user. It works now with new users, for old users they have to make a post or comment and once moderated (regardless of number of their old posts), their role is changed to Member. Thanks for the info. Im all set now.